Please be quite near the base of the Thumb. Falcons nest in the area. The north side of the Thumb is closed to climbers/all from Mar thru June. 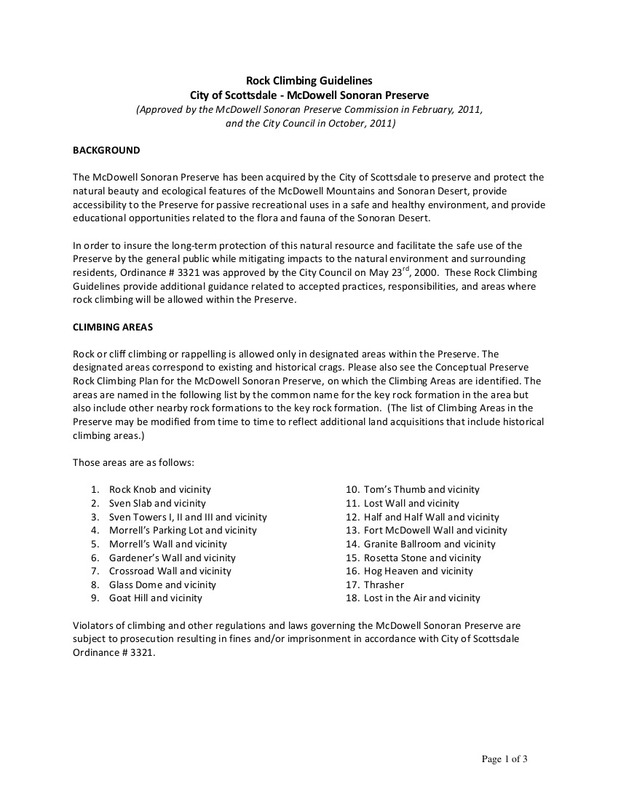 The McDowell Sonoran Preserve is owned by the City of Scottsdale and governed pursuant to City Code, which gives the Preserve Director the authority to manage the Preserve consistent with preservation of flora and fauna as the priority mission. 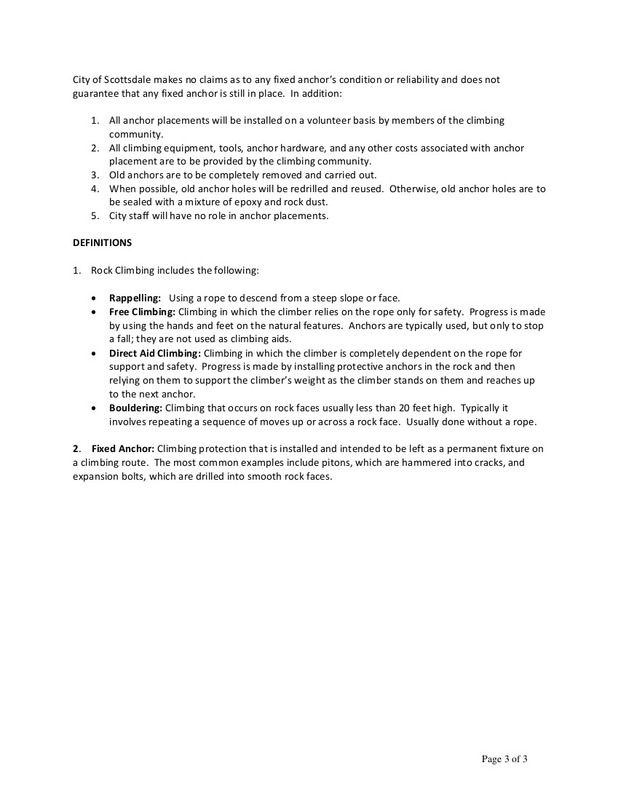 Failure to comply would be a serious loss to local climbers. 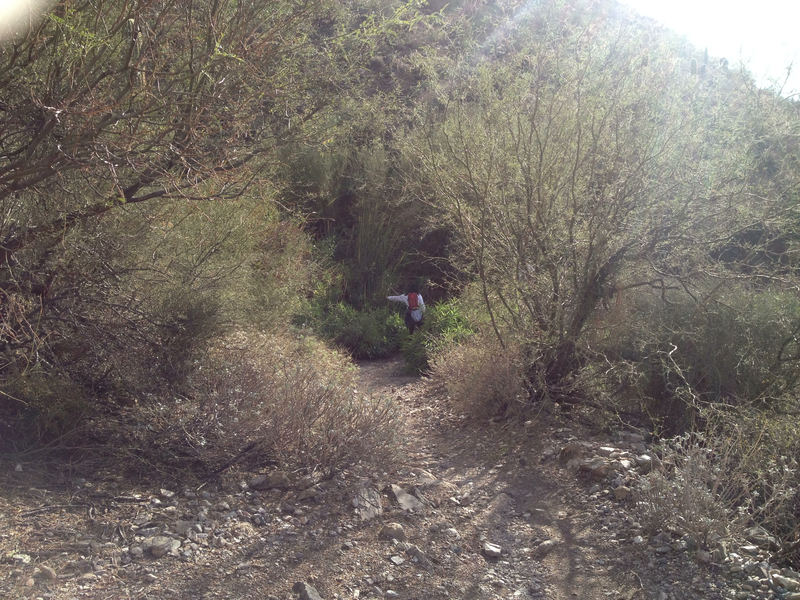 The Tom's Thumb Trail is one of many excellent trails within Scottsdale's McDowell Sonoran Preserve. In fact, it is one of the better known hikes in the Valley of the Sun since, on a clear day, Tom's Thumb can be seen from many parts of the valley. Tom's Thumb Trail is a "leg" trail that begins at the Tom's Thumb Trailhead and ends where it intersects the Windgate Trail. 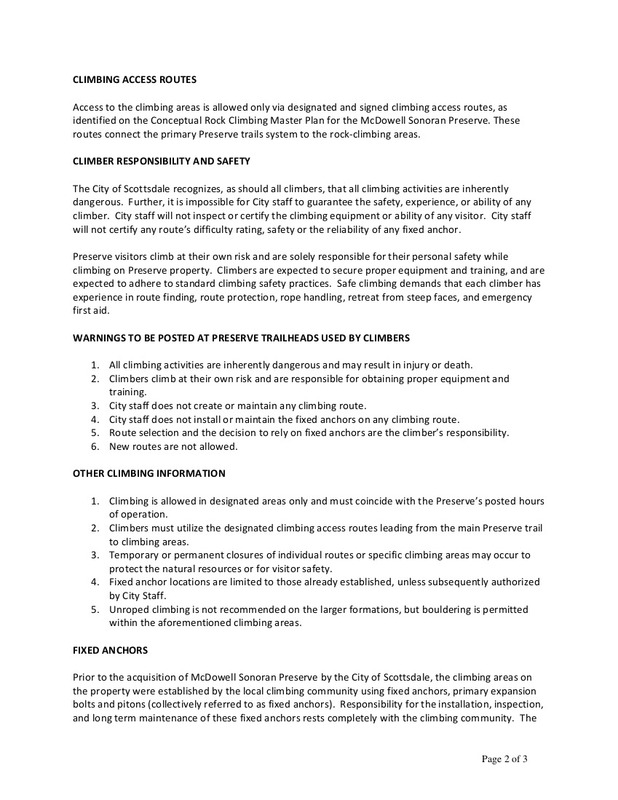 It is classified as "extremely difficult" (double black diamond) on the new (deployed sometime before March, 2013) "Preserve Trail Guide" on the City of Scottsdale's website. In actuality, that rating is more applicable if one does the hike in reverse, i.e. northbound, rather than southbound. While perhaps not extremely difficult, it is at the least "moderately difficult" (white diamond). The route and photoset associated with this description are here. 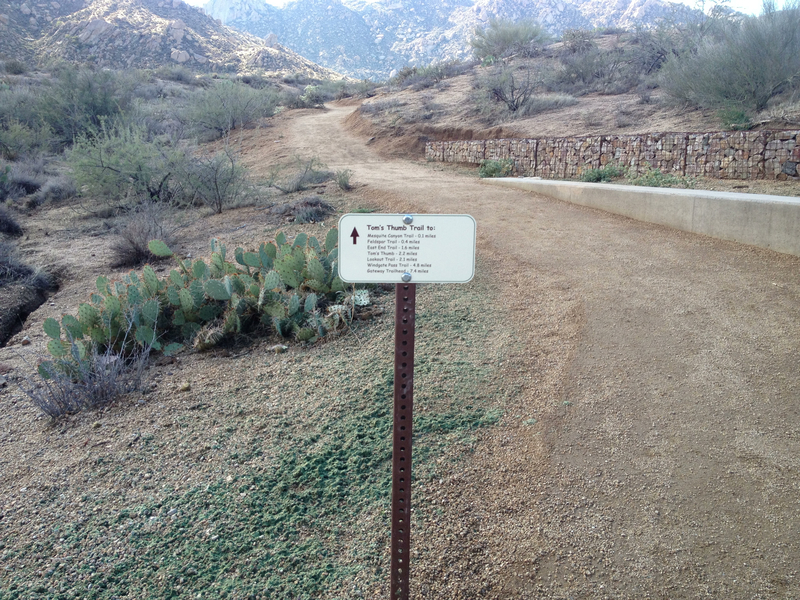 In October, 2012, Scottsdale opened the fancy-shmancy Tom's Thumb Trailhead. 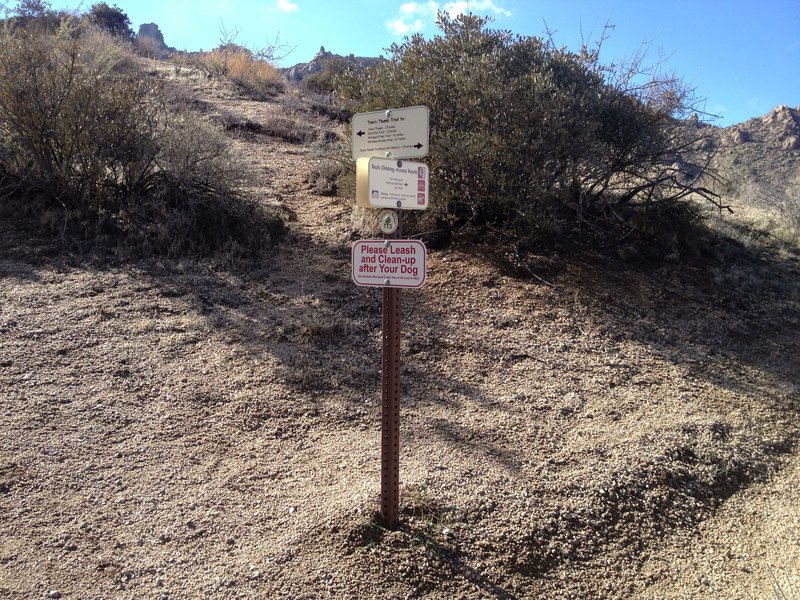 This trailhead has restrooms and information about the flora, fauna, rock climbing, and other activities accessible from the trailhead, but NO WATER. The "NO WATER" situation will persist for an indeterminate amount of time because there is no municipal service to the area and (presumably) no wells available to the facility. I was told by a McDowell Sonoran Conservancy steward that the city is waiting for developers to build out more of the area. 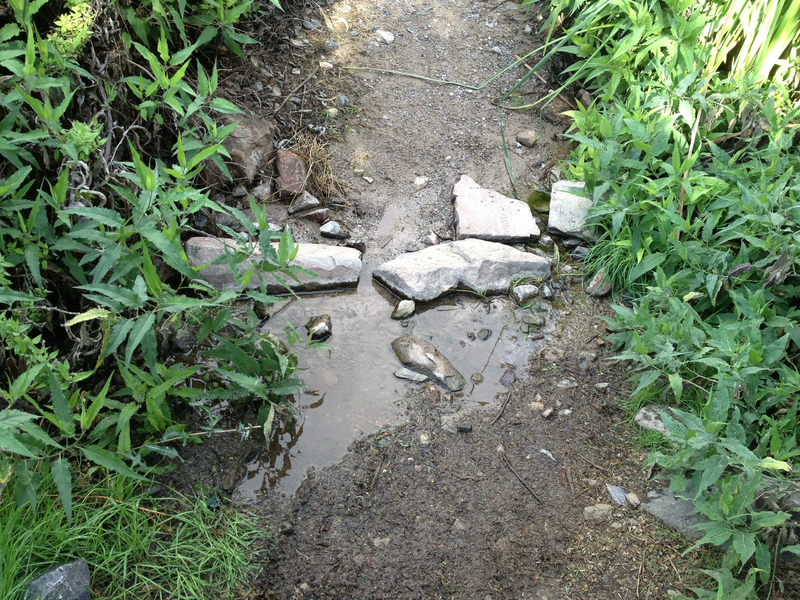 That way, developer money, and not city money, can pay for bringing water service to/close to the trailhead building. 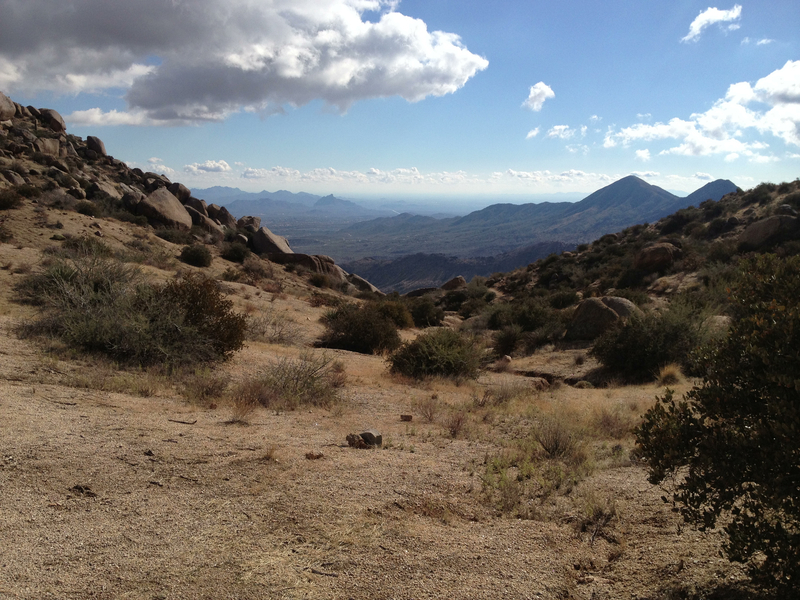 Because much of this trail is far from civilization, due care must be exercised while hiking Tom's Thumb Trail. If you hurt yourself and require professional/trained assistance, unless they helicopter in, professional/trained help could be at minimum 30 to 60 minutes away. The silver lining is that this trail is fairly well traveled so, at least, there will be passersby that may or may not be able/willing to provide aid. If you just pop in the coordinates of the trailhead, it's very possible that your GPS unit will tell you to turn from Happy Valley Road onto Alameda Road at (33.706667, -111.832396). Don't do it! Those GPS units don't know that there's a locked gate at (33.694441, -111.813335). If you take this wrong turn, after driving in a few miles, you'll have to turn around and backtrack to Happy Valley Road. 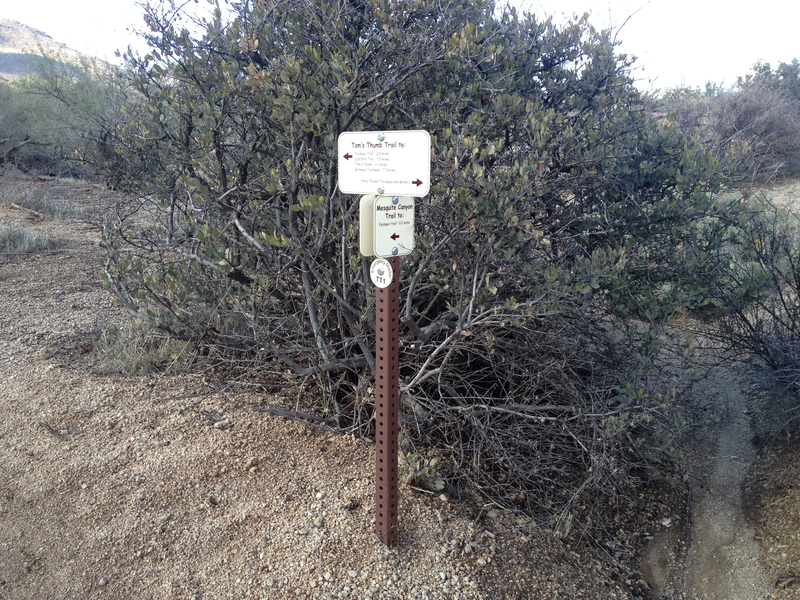 To get to the trailhead, you need to turn onto Ranch Gate Road from Happy Valley Road at (33.716213, -111.826406). If this is your first time to the trailhead and you're using a GPS unit to help you navigate, set that intersection as a waypoint or the destination. That point works as a destination because getting to the trailhead parking area from that point is pretty simple: after turning onto Ranch Gate Road travel straight for 0.43 mile before starting a casual meander to the right which meanders back and straightens out again in 0.58 mile. From that point (on the right, there's a divided access road to an as yet unbuilt, to-be-gated subdivision), its a quick 0.32 mile to the final turn to the right that will take you to the trailhead area gate, 1.05 miles south. 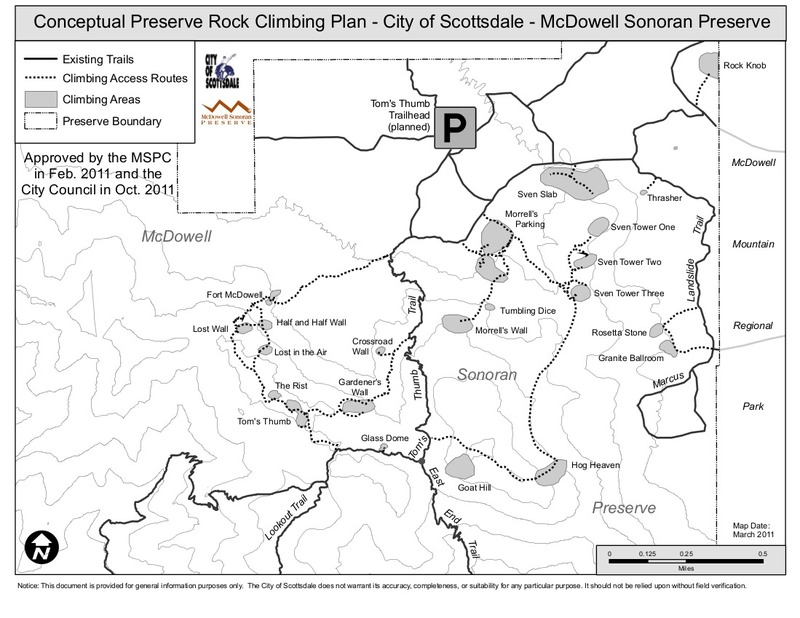 For the schedule of opening and closing times (these change every two weeks throughout the year), see the McDowell Sonoran Preserve page of Scottsdale's official website for a link to dates and times. The Tom's Thumb Trail is 4.71 miles in length from the trailhead building to Windgate Trail and can be said to be composed of four segments: approach and ascent (1.22 miles, 884 feet AEG, +883 feet elevation change), cruise (0.92 mile, 336 feet AEG, +108 feet elevation change), descent (2.11 miles, 205 feet AEG, -1,375 feet elevation change), and the rise (0.46 mile, 171 feet AEG, +154 feet elevation change). 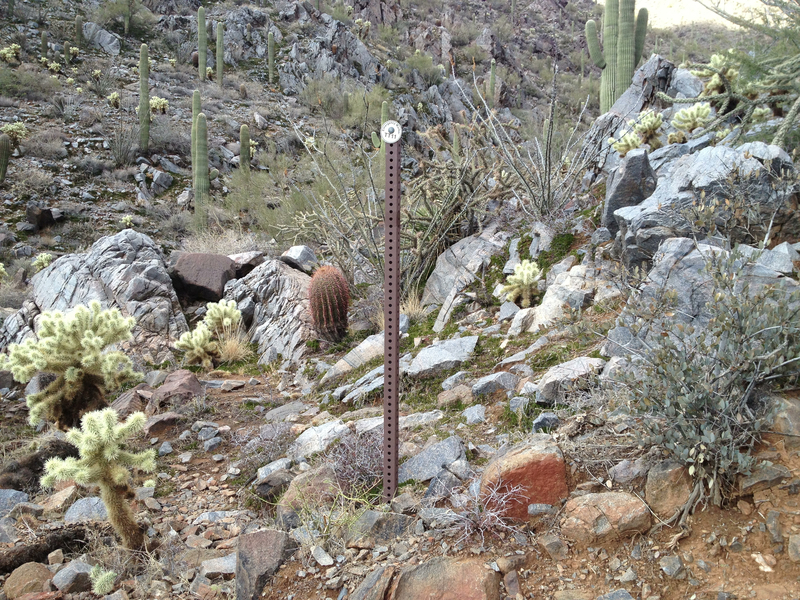 The cruise section includes the spur (0.24 mile, 157 feet AEG, +118 feet elevation change, one-way) to Tom's Thumb itself--the Thumb is not on the main portion of the trail. Interestingly, for you writers out there, the topographic development of this trail closely mirrors Gustav Freytag's dramatic structure for a comedic arc. 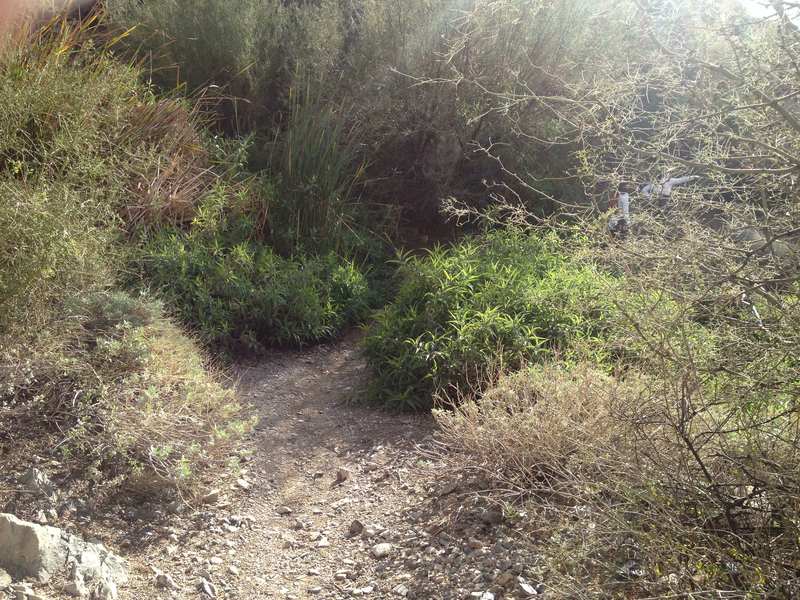 The initial portion of the trail starts gently with the approach. 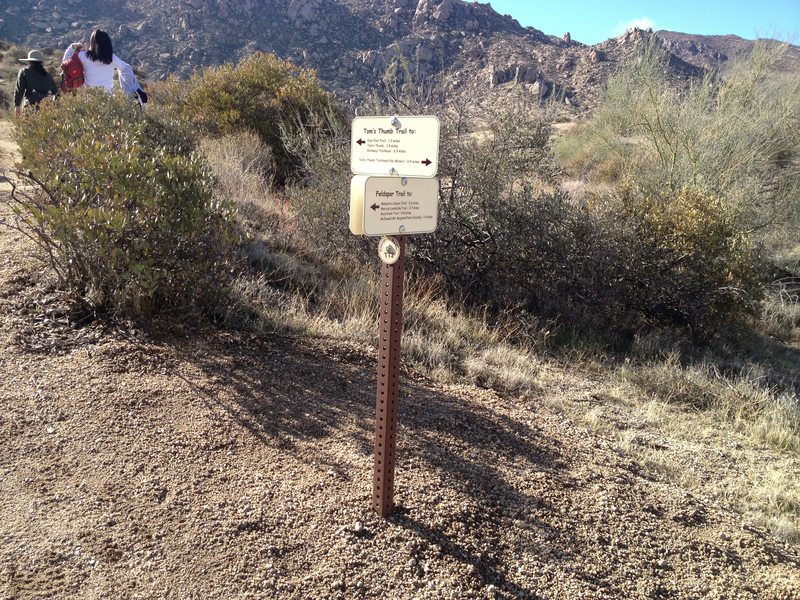 From the new trailhead building, follow the signs southwest towards Tom's Thumb, visible on the mountain in front of you. 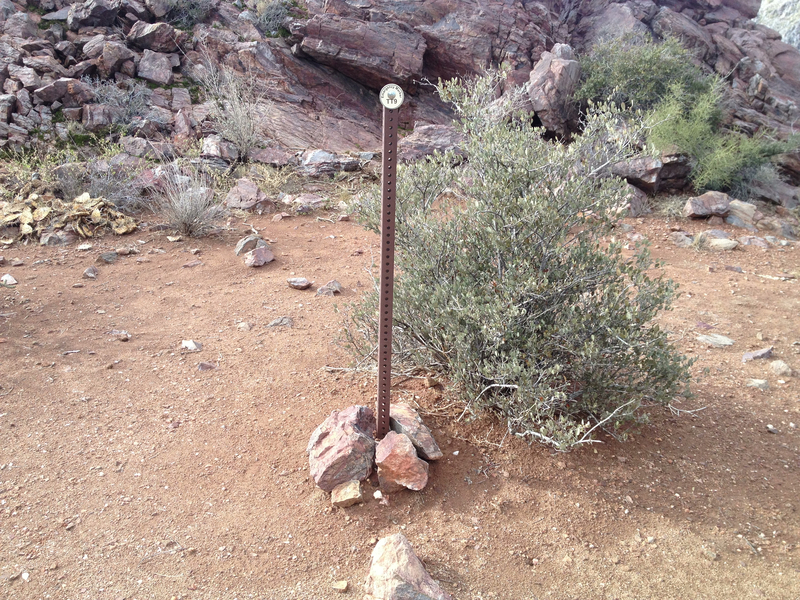 About 0.08 mile from the trailhead, you'll come upon Emergency Marker (EM) TT1 which is also the jumping off point for the Mesquite Canyon Trail that heads off east. In another 0.35 mile, you'll see another EM, TT2, which also indicates the starting point for the Feldspar Trail. 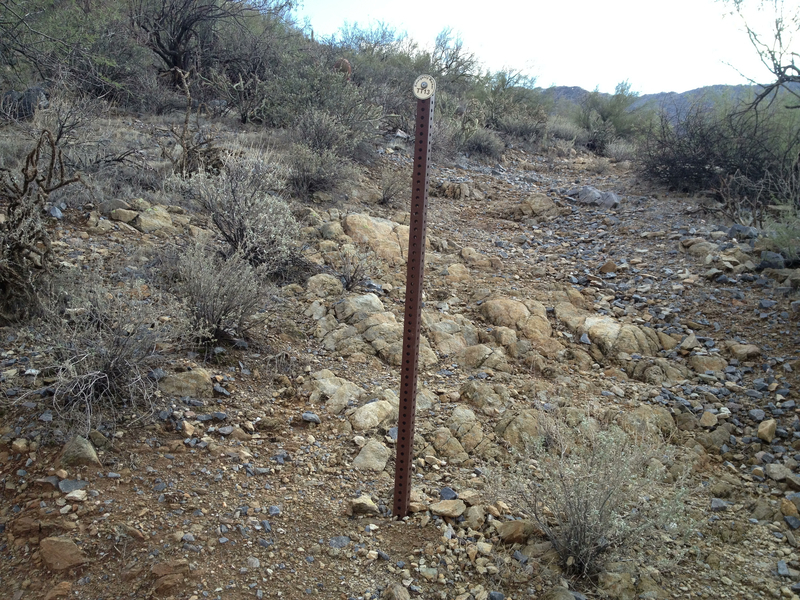 This is the point at which the new trail from the new trailhead merges into the old Tom's Thumb Trail which began at the parking area at (33.689200, -111.801500). TT2 marks the beginning of the ascent and for the next 0.40 mile, the trail heads upward pretty consistently at a moderate grade (average, 10.7º/18.4%). 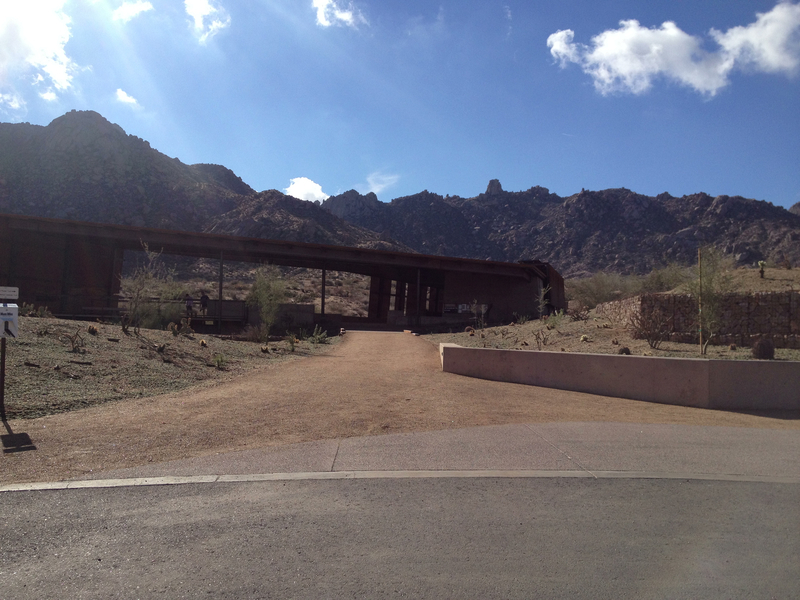 Along the way, you'll pass EM TT3 (which also leads to some rock climbing areas), an informal scenic view area, and the final opportunity to look upon the trailhead building from the trail. The next 0.09 mile is a relatively flat section that, just before the final segment of the ascent, allows a view off to the northwest between two folds of the mountain just steps before coming upon EM TT5. After that short break, you start the final push upward with that last 0.30 mile being at a pretty consistent, moderate grade (average, 11.1º/19.5%). The end of the ascent section is the top of the northern side of a major fold between the East End system to the east and the Peak 3890 (33.677439, -111.805314) system to the west. While the overall change in elevation of the "cruise" segment is relatively small (+108 feet over 0.92 mile), the AEG of 336 feet reflects that the trail rolls a bit over its course. After a fairly level 0.17 mile south along the northern/eastern face of the fold, you'll jog to the right and then pass through some rocks to look down onto the northern part of the fold. In the distance, as the gateway to the southern part of the fold, is the northern terminus of the East End Trail, while closer in is the lower terminus of the East End Peak Trail. As you make your way to the East End Trail terminus, Tom's Thumb is a prominent feature of the scenery and some people take fun pictures. At the East End Trail terminus, take a look southeast down the East End Trail. What you'll see is just a taste of the spectacular views offered by the top/northern part of the East End Trail. 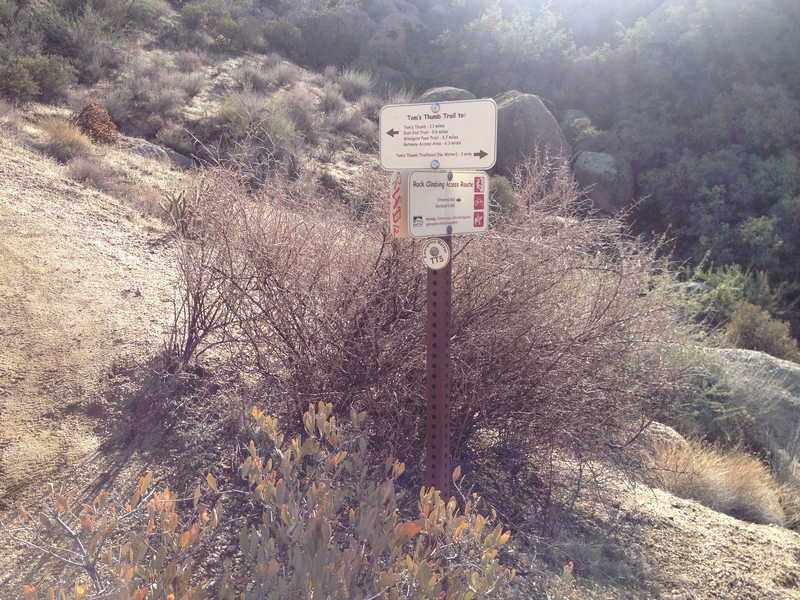 Beyond the terminus, the trail starts to climb and after passing between two massive boulders and walking 0.33 mile, you reach the southern terminus of the Thumb Spur. The Thumb Spur is a short, easy, fairly well marked, popular segment. 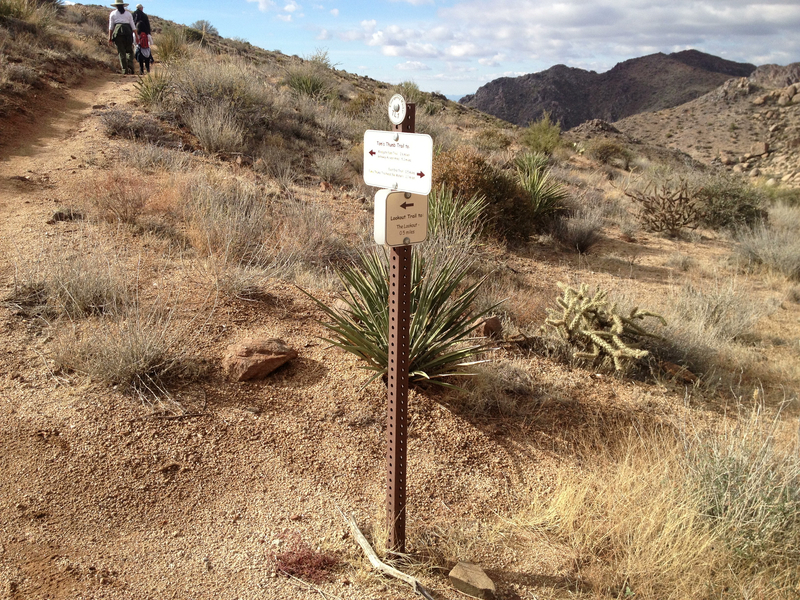 Many people are under the impression that the spur is actually a part of the Tom's Thumb Trail, proper, and that the trail ends at the Thumb; but they are mistaken. 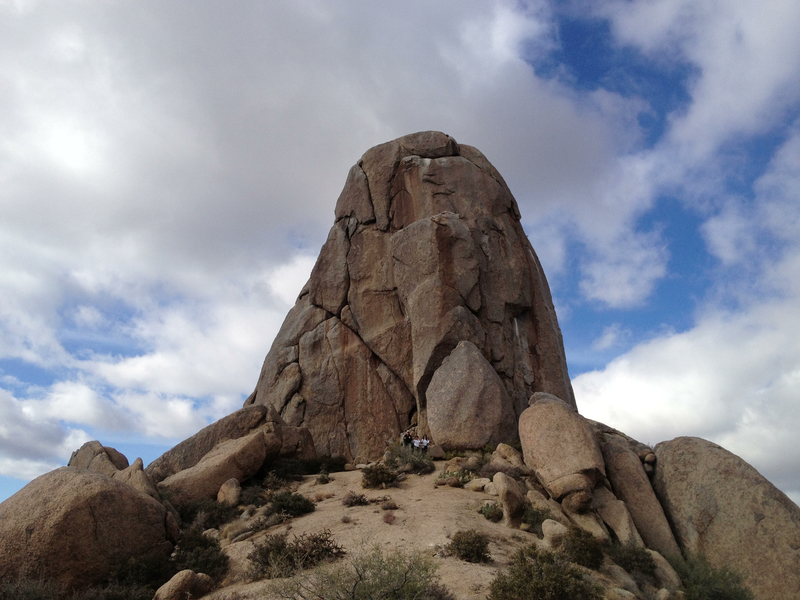 As you'll see, there's much more to Tom's Thumb Trail than just the trek to the Thumb. 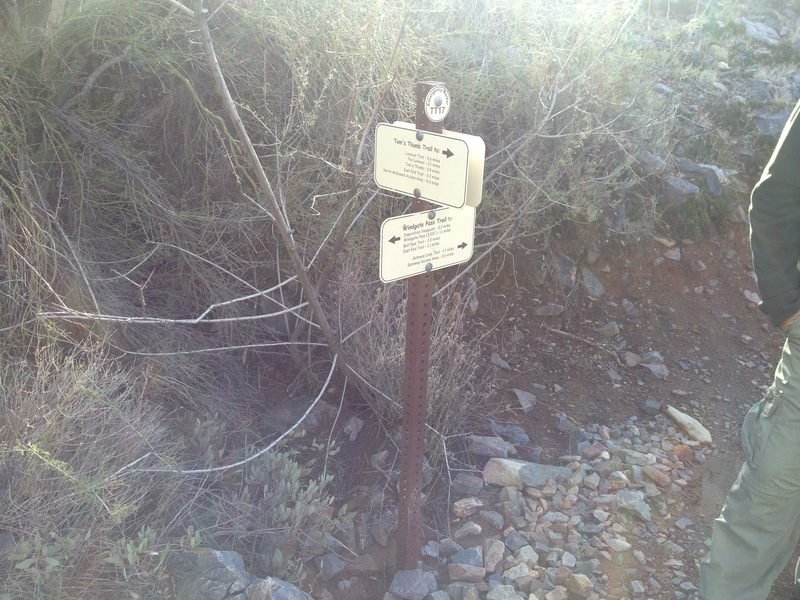 The only slightly tricky, less obvious and less well marked part of the spur trail is about 0.15 mile in. 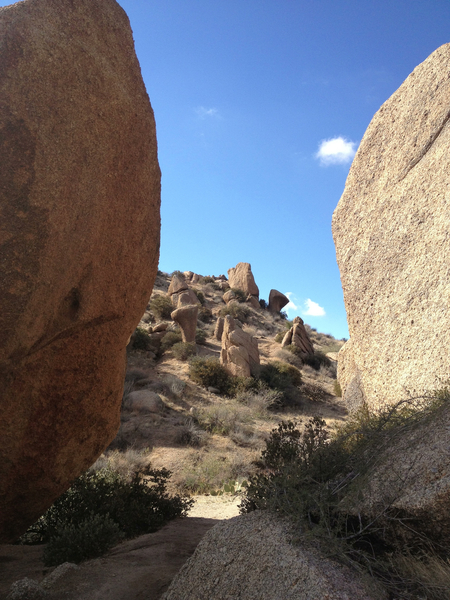 When you get to this point, stay to the right, hop up and over the boulders and prickly pear, and pass to the right of the boulder pile to continue to the Thumb. If you go to the left and scramble up what looks like it could be the trail, you'll soon end up at what could be a temporary shelter. Back on the actual trail, about 0.02 mile past that confusing spot, you'll do a bit of bouldering and then see the Thumb emerge. From a vantage point just short of the base, the Thumb looks more like a blunt traffic cone than a thumb. After returning to the trail, there's still a bit of the cruise segment to do. A short 0.12 mile beyond the spur, is the northern terminus of the Lookout Trail. 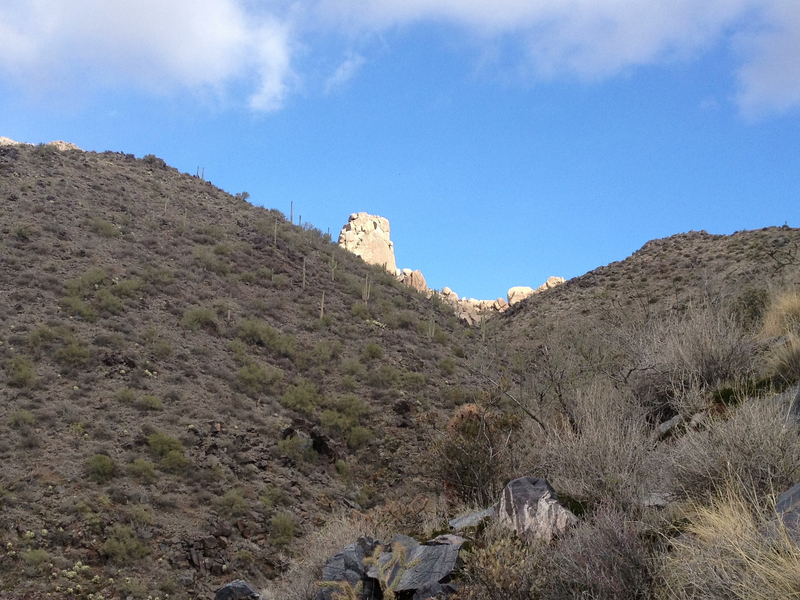 Beyond that point, and just before the trail rounds to the left, you can look back and see the Thumb from a vantage point south of it--just like when you're in Scottsdale or Phoenix, only a whole lot closer in. Because the majority of Thumbsters head back to the trailhead after their photo op with the Thumb, relatively few people get to see the southern face of the Thumb the way you can at this point. Now, as you swing to the left, you also start up a slight incline that ends as you again hang to the left and top a gentle ridge. 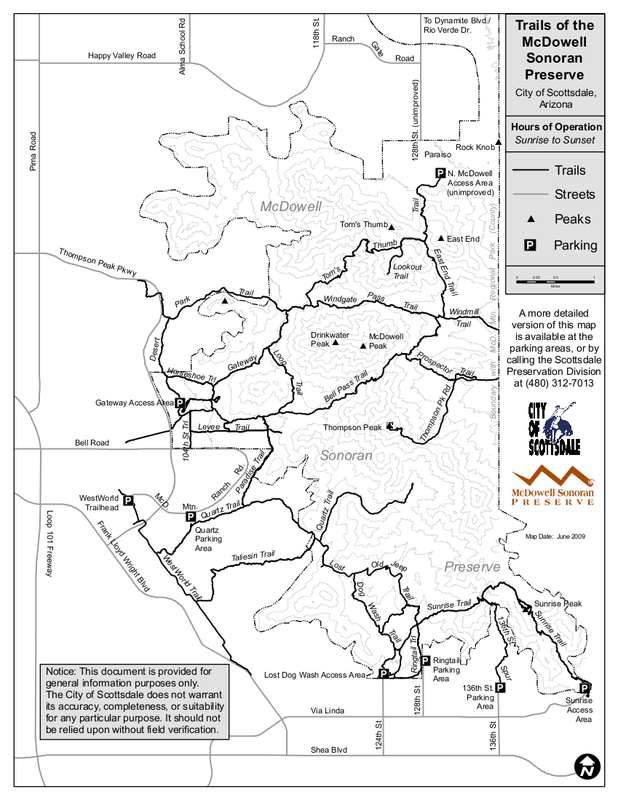 The longest section of the trail is the descent segment at 2.11 miles in length. The top of this segment is the uppermost point of a fold between two major ridges: the northern ridge sports Tom's Thumb and the southern ridge includes Lookout Trail and The Lookout at that trail's end. The descent takes you down into the fold and to the lowest point of the trail. There are a few up-trending breaks along the fairly consistent downward march, but all-in-all, the average slope of -7.0º/-12.3% is a pretty good indicator of what you'll experience grade-wise. 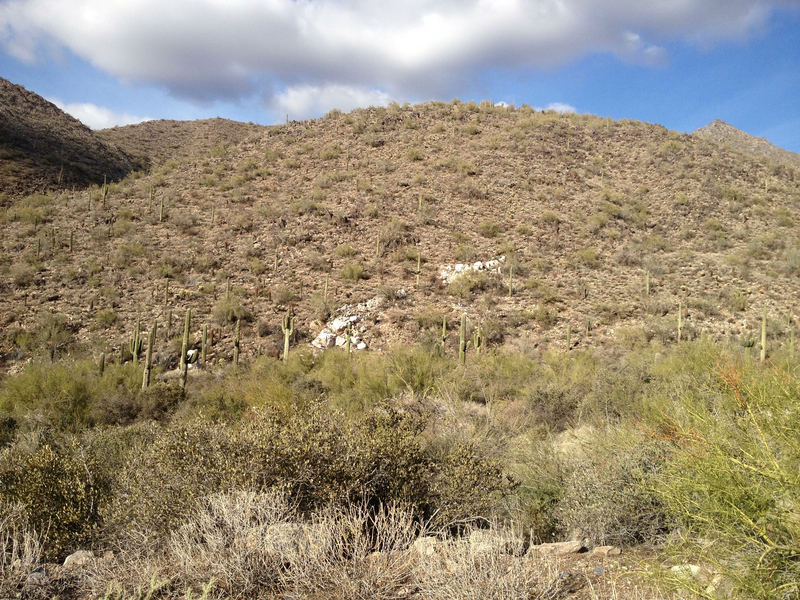 At the top of the descent, you'll be treated to a panoramic view down onto the central part of the McDowell Sonoran Preserve, Scottsdale and Phoenix. As you trek over the course of this section, you'll again see another nice view of the city below, be able to watch the Thumb "set" behind the mountains, pass by EMs TT9, TT11, and TT13, and see a bit of outcropping quartz. However, the highlight of the descent occurs near its end as you round a curve to the left and spy a splash of green that turns out to be a full oasis. 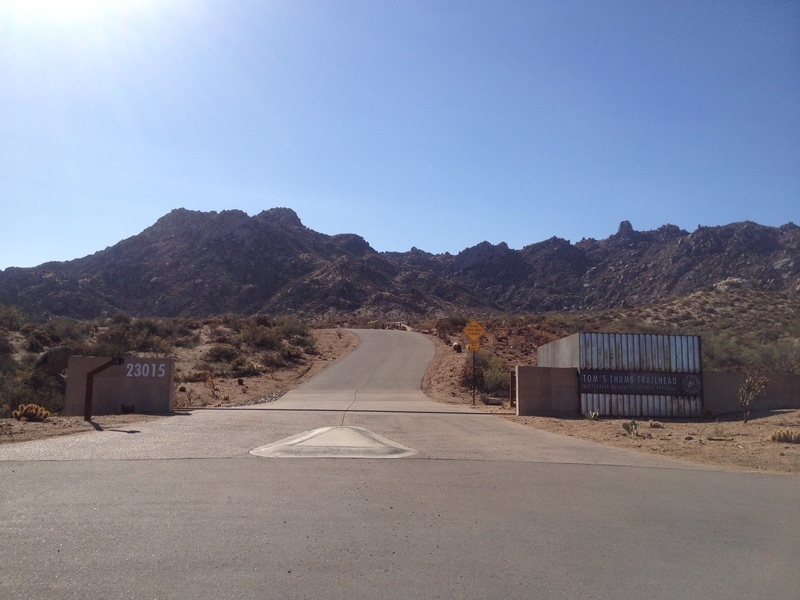 A quick 0.27 mile past the oasis, you reach the end of the descent segment. 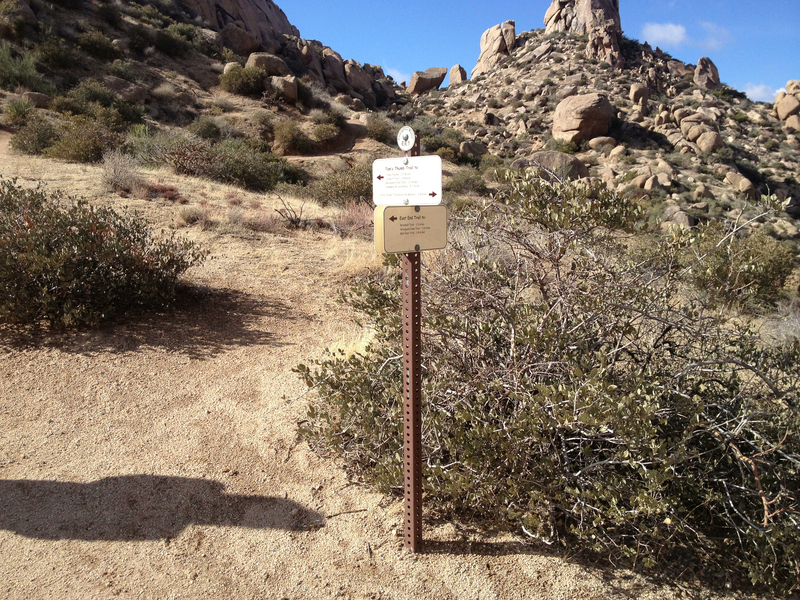 The denouement of the Tom's Thumb Trail is a short, 0.45 mile segment with a modest AEG of 171 feet. Soon after commencing this section, you'll come to EM TT15 which marks an emergency exit of sorts. If you follow the creekbed-like trail forward and down instead of up and to the left, satellite images indicate that 0.44 mile later you take a hard right onto a faint 0.03 mile stretch that leads to a wash, at which you turn left. About 0.10 mile down the wash you'll be on North 112th Street next to a house. While 0.57 mile can be a very long way if you're injured, it's a lot closer than any other escape alternative. 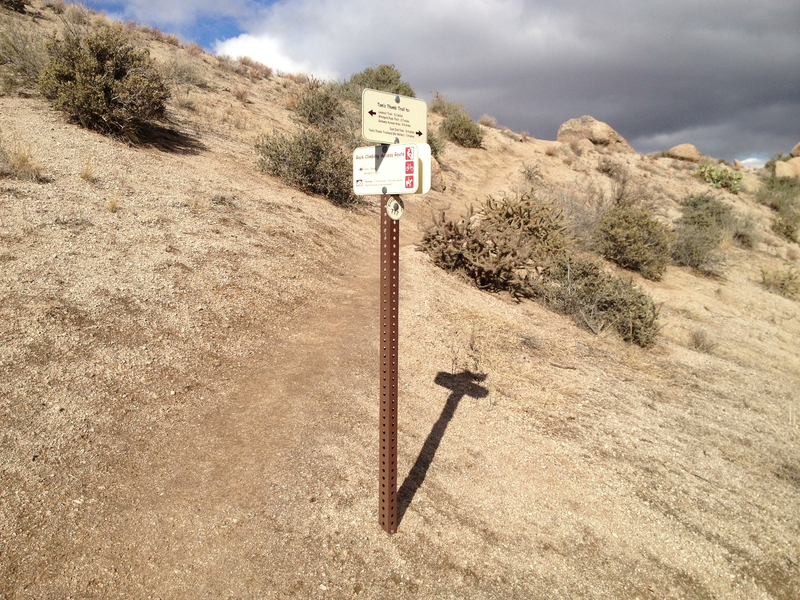 If, at EM TT15, you take the trail up and to the left, 0.38 mile later you'll reach EM TT17 and the Windgate Trail. About 0.10 mile south of EM TT13 at approximately (33.672252, -111.821558), there is a long running mountain spring. The spring is even noted on topo maps. This spring produces a flow that crosses the trail at (33.672303, -111.823663). It's not a gusher, but it's enough to wet a parched throat (after appropriate precautions).